As a mercenary soldier of fortune, Calvin Waller has grown used to danger. Danger is the air he breathes. But when he finds himself thrown from the midst of an African battle into a primitive farm community of the future, he is naturally disoriented. Trained as he is, he quickly gets his bearings and begins a new and different battle…only to the “thrown” again. He is being manipulated. Falling Toward Forever is the story of his search for The Manipulator, and for himself. A strange and wonderful search…for The Manipulator holds all the strings. Hoooooo golly. What a cover. You can probably tell by the little signature, or perhaps the style, that this cover is by Frank Kelly Freas. You might also be able to tell that because it is awesome. I particularly like the little dudes in the bottom left corner. They are adorable, although I think in the book they were supposed to be scary. And there in the background is the Emerald City or something like it. But, of course, the eyes are drawn to Screaming Guy. Screaming Guy does not look happy, and why should he? He’s chained to that woman, who is in turn chained to—best that I can tell—a Dementor. Try as I might, I just cannot tear my gaze away from Screaming Guy’s mouth. That weird asymmetrical angle, those teeth, everything about it just draws me in in a way that I’m not entirely comfortable with. The publishing line, Laser Books, has an interesting history. It was a line of science fiction novels put together by, of all people, Harlequin Romance. Apparently Harlequin just wanted to get a bite out of the SFF market, which is just crazy to me. You’d think they would figure they make enough money from the romance market. There were 57 books released under the heading, all of which had art by Kelly Freas, because if anybody could afford 57 Freas covers, you know it would be Harlequin. According to Wikipedia, some of the authors published under the heading—a list that includes Piers Anthony, Jerry Pournelle, J.T. McIntosh, and J. Hunter Holly—took issue with the way Harlequin handled their books. Tim Powers, in particular, felt that his book had been “butchered.” I have a feeling that these issues may well have had something to do with my reception of Falling Toward Forever. This book was just bad. 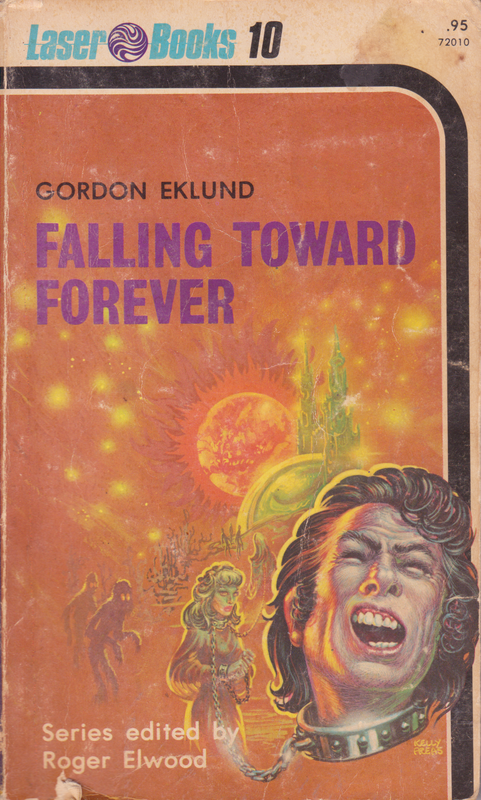 I found this strange because Gordon Eklund has a Nebula Award to his name, which of course doesn’t mean I’ll like him or that everything he wrote was gold, but still, it sets up a certain expectation. I expected to find something of quality, though, and this book sure didn’t have much. I’m gonna say this was another car payment book. I’m being unfair. This book did have some things of quality. The characterization was okay, and, for all its plot faults, I found this book very easy to actually sit and read. It held my attention, but in the end that makes it even more disappointing because my attention was chiefly held by the fact that I was hoping to get some kind of resolution, which never happened. This book had one of the most shockingly bad endings I’ve ever had the pleasure of reading. The book starts with promise, though. Our hero, Calvin Waller, is a mean dude. He doesn’t mean to be mean, he’s just been forced into it by circumstances. He was drafted into Vietnam at 18, although I think the book just says he was “sent to war” or something like that, and that left him with nothing else to do. He missed his opportunity to get an education and find a vocation. All he knows is war, so that’s what he does. The back of the book calls him a “mercenary soldier of fortune,” which is just great in its redundancy, but it gets the point across. Waller will keep his ears open for wars he can poke his nose into and then goes to them. He picks sides not based on any kind of ideology or sense of justice. He picks the underdogs, every time. There’s a certain tragedy about that that resonates. I felt sympathetic for him, even though I was never drafted or anything like that. So while fighting in some war in an unnamed part of Africa, Waller is helping some insurgents storm a base or something. He has a long conversation—large chunks of this book are long conversations—with one of his comrades, a guy named Ahmad, before heading into the fight. Ahmad says he doesn’t trust Waller, not because he’s afraid Waller is a traitor or that he’s lacking in competence, but because he’s got some kind of a death wish and Ahmad doesn’t want to be anywhere near Waller when the poop hits the fan. Battle commences, a base is stormed, and Waller finds himself face-to-face with a pretty white girl. He’s surprised by this, but his surprise is upstaged when he begins FALLING TOWARD FOREVER. Waller wakes up and finds that he is not in Africa anymore. The weather is nice and there are pine trees. He figures that he’s somehow found himself in the Pacific Northwest. Before long he’s reunited with Ahmad and the blond girl, whose name turns out to be Sondra. After a lot of initial mistrust, the three realize that if they’re going to survive, they have to get along. One of the flaws with the text starts to come about here, and it keeps popping up throughout the rest of the book. It seems that either Waller is always the last to arrive whenever one of these crazy jumps happens, or maybe he’s allergic to them or something and winds up falling asleep for a while, because it always turns out that Ahmad and/or Sondra are way ahead of him on all the details. While he’s out cold or in the process of teleporting or whatever, his pals are figuring out everything that they need to know so that they can explain the situation to him over the course of a few pages. Very rarely does Waller figure anything out for himself. It’s like his pals are a pair of expository tricorders that he can send out while he takes a nap. So Ahmad and Sondra explain some of the things they’ve discovered since arriving. There are people, but those people are pretty strange. They’re basically white people running around like Indians, but based on the climate they’re a pretty long ways from Taos. There’s a corpse nearby that Ahmad found that’s been stripped of its flesh in a way that only a cannibal would do. Near that is a strange coin that looks a lot like a dime except that it has a different head on it and the date reads 2039. While we were never actually given a date for when the beginning of this book takes place, I guess we’re supposed to assume that 2039 is in the future. It turns out that there are two tribes of people living in the area. One tribe consists of warlike cannibals, the other is a tribe of peaceful gardeners. The cannibals keep picking on the gardeners, taking their people and eating them. It’s all very sad, so Waller figures he’ll do what he does best and help the gardeners out. There’s only one gun between everybody, so Waller teaches the natives to kill people with sticks and spears and whatnot. The gun is also helpful when it comes to the final showdown, which is of course successful and everybody’s happy. Well, no, not everybody. Sondra isn’t happy. She’s upset that Waller has taken away the purity and innocence of these people and led them down a path of war and destruction. There’s a lot of back-and-forth about whether it’s better for these people to die innocents or live having tasted the fruit. I, for one, am in favor of living, so I kinda came down with Waller on this one. Fighting might be a last resort, but there’s no time for crying about it when that last resort finally becomes the only resort, you know? There’s another time bamf, and what’s this? Somebody else came along!? NORGO has joined the party! Norgo is a woman from the good guy tribe, and in fact she was supposed to take over as the chief or whatever after the great victory against the cannibals. Unfortunately, it seems that won’t happen, because everybody fell into the future again without any kind of resolution to the previous story. For its flaws, this second future jump leaves us with an interesting timeline. The party finds itself in a giant tower, 300 stories tall, which is so large that a whole city’s worth of people live inside. Hierarchy is based on floor number, and each individual floor is large enough that it can actually sustain agriculture. Waller and crew are among the slaves on the lower floors, and there is no escape. No explanation as to how or why this situation is here is ever given, although it’s pointed out that it started so far in the past that nobody really remembers, so I’m going to give that the OK.
Once again, it’s up to Ahmad and Sondra to figure out what’s going on and then explain it to Waller. In this case I don’t even think we can pin it down to him landing later or anything, it’s just that he’s so mopey about being a slave that he stops caring and just plants his seeds everyday until he goes to bed (not a euphemism). Apparently it goes on so long that Ahmad has had time to learn the local language, and Sondra has had time to make friends, especially with a dude named Coulton. Waller is aware of Sondra’s friendship with this Coulton guy, and he’s jealous. As you might expect, it turns out that Waller secretly loves Sondra and Sondra secretly loves Waller. They reveal this to one another and, reinvigorated, Waller decides that it’s time to lead a coup against whoever is at the top of this tower. Ahmad gets some kind of village elder to tell Waller all about this amazing guy some generations back. The story goes on for pages. What’s especially great is that the author excuses himself from this long boring diatribe by pointing out that this is the only way the village elder can tell the story. See, he memorizes stories in a particular fashion. He can’t, say, start in the middle and get to the point. No, if the story of The Day the Bandit Stole the Corn is the only way we can get to The Night We Found Out the Weakness of the Masters, then dammit you’re about to hear about a bandit stealing some corn whether you want to or not. This is great because I’m doing NaNoWriMo and I can totally sympathize with this desperate ploy to meet a word-count target. So once a guy named Coulton made it to the top and now people name their kids Coulton a lot but our particular Coulton might just be the promised one so Waller decides to bank on that and he stages a revolution. It works pretty well. Also COULTON has joined the party. This is the last time jump, I swear. The book is almost over. Also, no resolution at all on the tower story. In this last time-frame it’s so far in the future that the sun is orange, humans have left the planet, and apes have evolved back into humanoids again. All of this, except possibly for the orange sun part, is told to us and Waller via everybody else. Okay, so not all the humans left. There’s a big glass dome on a hill somewhere, and Waller and crew want to know what’s up with it. They can see a humanoid figure inside that’s different from the native humanoid figures outside. Everyone assumes that this is the final stop and that this person in the dome is, of course, THE MANIPULATOR. So, sneaky-sneaky, they get into the dome. It turns out that yes, this guy is root cause of the time jumps. Ahmad finds this out. He also finds out the rest of the story. He expositions us. It turns out the manipulator guy is crazy. He seems to think that one of the main party—Waller, Ahmad, or Sondra—is the cause of some kind of catastrophe and they need to be stopped, so he got ahold of this time machine and yanked them out of their timeline. We never find out what his reasoning was, or what our heroes were supposed to do, or anything at all, when Ahmad figures out that the time machine doesn’t just pull people out of their native time, it keeps them there, acting against some kind of time-gravity-force. So if they blow up the machine, everybody can go home. I don’t know if I have anything else to say besides UUUGGGH, to be honest. That was such a crappy ending I can’t stand it. But I do want to come back to this Harlequin thing. See, not only did Harlequin mess around with books, removing “scatalogical” and “blasphemous” references (according to Wikipedia, again), but they had a rigid word-count limit to all these Laser Books. They had to be between 50,000 and 60,000 words, which is quite short for a novel, although if you’re doing NaNoWriMo I know from experience how long 50k words can seem. I just wonder if maybe some parts got cut out by the editor. On one hand, it does feel like Eklund went on a bit too long in some places, giving us tons of expository backstory where it was unwarranted, but the fact that so many other parts of this book seemed unfinished leaves my head spinning. The book was also chock full of grammar and style errors. Missing commas, weird syntax, and in one case, a turn of phrase that was repeated twice within two paragraphs. What really got me, and this is a weird thing to think so bear with me, was that every time one of those errors popped up, my brain went “Gee, Thomas, those are the kinds of errors you make.” I don’t know if anyone else has ever experienced that kind of realization before, but I’d love to hear about it. It’s not that I felt like Gordon Eklund and I have similar styles, but we do have similar errors, and that’s weird. At least we’ll always have Screaming Guy. I assumed screaming guy was screaming because he was now a disembodied head.